A striking landscape showing two shepherds and their flock in the snow has been attributed to the nineteenth-century painter Charles Jones (1836–1902). Held in the collection of Atkinson Art Gallery, the artist had been previously listed as unknown. While initial attributions varied, all were artists who painted similar subject matter to the painting in question. Martin Hopkinson suggested the painter Robert H. Watson who has five paintings held in the UK public collection, four of which feature sheep. Watson was also a resident of Southport, the home of the Atkinson Art Gallery. 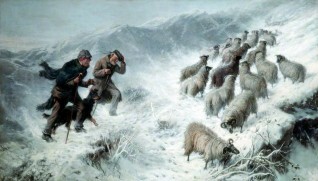 Gabriel Wolf suggested both the Dutch artist Anton Mauve and Scottish landscape painter Joseph Farquharson, known for his images of sheep in snow. Like Charles Jones, each of these artists was working in the late nineteenth century. The focus of the discussion was narrowed after Betty Elzae’s close examination of the shepherds’ clothes. Betty dated the attire to the 1880s and pointed out a distinctive traditional Scottish hat, the tam o’ shanter, worn by one of the figures. The painting was identified as a scene from Scotland. The suggestion that the work was a Scottish landscape was confirmed and added to by other contributors. Paula Marmor helpfully identified the breed of sheep as Scottish Blackface. This was seconded by John Covell, who also suggested Edward Duncan, a renowned nineteenth-century maritime painter, as the possible artist. The attribution that was eventually accepted came from Tim Williams. Charles ‘Sheep’ Jones painted many landscapes featuring sheep and cattle. Tim chose a selection of these to support his attribution. He cited a particular similarity between the foreground grass in the painting under discussion and in Jones’ work ‘On the Hills of Scotland, Winter’, held by the Royal Institute of Cornwall. This painting also features a figure wearing a tam o’ shanter, similar to that identified by Betty. Tim’s appraisal met with quick approval from Martin, who pointed out Jones’ distinctive treatment of snow. Andrew Greg then shepherded the discussion to a close by formally endorsing Tim’s strong attribution, which the collection accepted. This discussion focused on identifying the artist of the painting, so opportunities remain for future research. Martin Hopkinson revealed that Charles Jones regularly exhibited in Liverpool. Perhaps a record of this work could be found at a collection in the area, confirming the attribution and an exact execution date for the painting? If any Art Detectives have information about ‘Shepherd and Sheep in Snow’ that could help fill in these gaps, please propose a discussion by following the Art Detective link on the artwork's Your Paintings page. Does anyone know who painted 'Shepherd and Sheep in Snow'?